Dallasites101 Presents a Workshop Series with Pressed Flower Crafts! 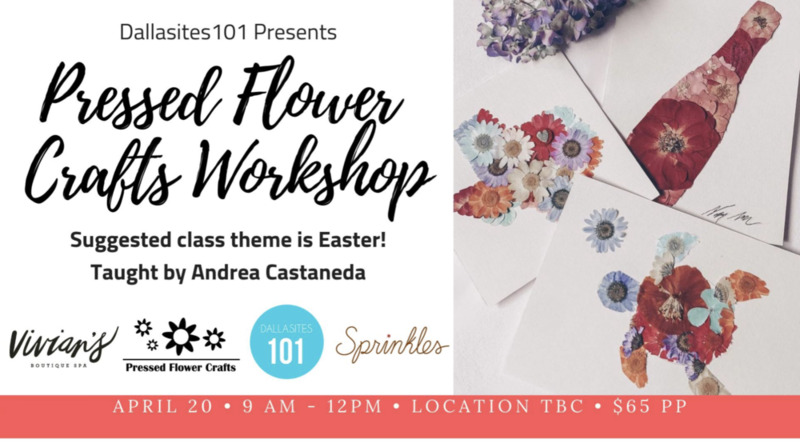 We are so excited to partner with Andrea Castaneda, Owner & Designer of Pressed Flower Crafts, to bring to you a series of workshops in 2019! Each workshop will include creating a timeless piece of art handmade with pressed flowers, inspired by the time of year that it's hosted! The theme for the first class, on March 23rd, is "Spring is in Bloom." **All materials you need for creating a piece of art will be provided, but we do require that you bring a thick book to press your own flowers! ** Matted frames for your pieces will be available to purchase (optional). - a pressed flower sticker, super durable and dish washer safe, perfect for tumblers, coolers, car, laptops and more. Disclaimer: Pieces created at the workshop are for personal use only and cannot be duplicated or sold.